Pyrrha and me. Photo by Grace Farson. a. comic or burlesque, and usually loose or irregular in measure. 2. Alternately, the language by which one speaks to the dogs one loves. After a year of intensive dog research, reading, planning, and learning from all of you in the dog blogging community, I welcomed my first dog into my life on May 17, 2012. Pyrrha (*pronounced “peer-ah”) came to us from Southeast German Shepherd Rescue. This blog will continue to be the story of our adventure with our first dogs and raising them into happy, healthy, and confident members of our little family. 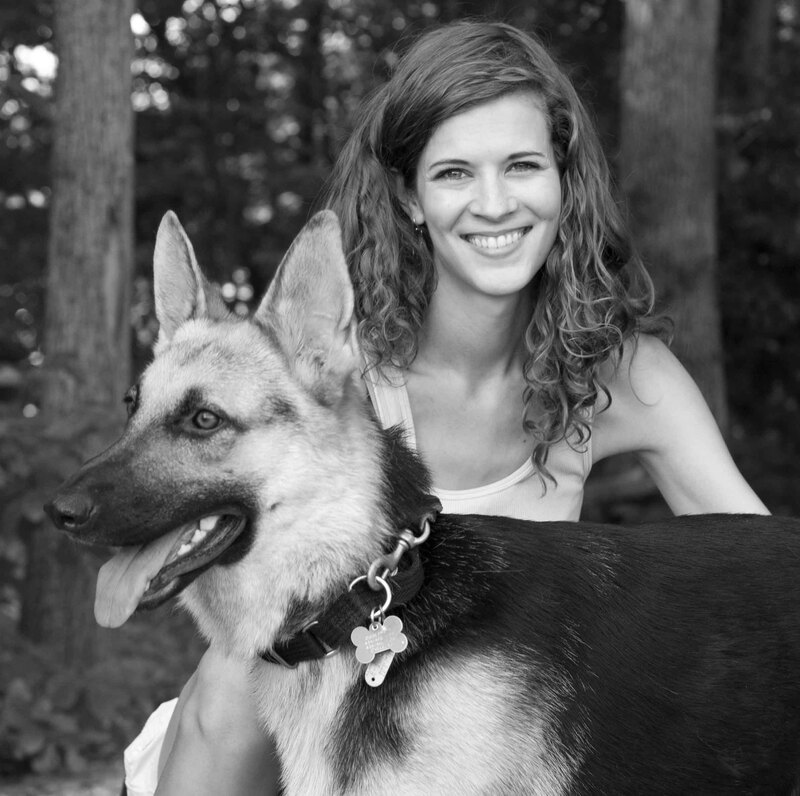 Thanks for reading and for sharing your advice and dog-rearing wisdom with me! Hi. My name is Abby and I am fairly obsessive about dogs. It’s only a matter of time before I become a Crazy Dog Lady. But I have to get a dog first. This blog started on May 10, 2011. One year from now, once we move out of our apartment, I will finally be able to get a dog. This blog is a project in patience. During this year of waiting for a puppy to call my own, I will be a student of the canine world. I’m reading books and blogs about dogs; I’m walking neighborhood dogs; and I’m volunteering at the local SPCA. Getting a dog is a big responsibility. I know this and so I want to spend this year responsibly, by learning as much as I can about (wo)man’s best friend. This blog will become my personal ledger of the things I’m learning about dogs and dog life in my year of waiting. I hope to learn from other dog-wise bloggers along the way, so please, share your insight! I don’t know much, but I am eager to learn. I hope my few words here will be proof of that. When I’m not working as a copy editor or daydreaming about dogs, I write a personal blog called Little Stories and run a part-time calligraphy business, Bluestocking Calligraphy. I live with my husband, Guion, who is a poet and musician. Feel free to contact me at doggerelblog[at]gmail[dot]com. Follow Doggerel on Twitter @abbyfpratt, on Pinterest, and on Instagram @farsonpratt. I’m so happy I came across your blog! I’ve been slowly reading Inside of A Dog, and when I saw your review on Freshly Pressed, I wanted to see what you thought…glad to know it’s worth the read! I’ll definitely be stopping by a lot to use your learning to help my own! I am a doggerel woman, too. I wrote a post a while back with my pups: http://sdliving.wordpress.com/2011/01/25/the-black-huntress-a-roaring-lioness/ … We have a few animals out here in the country, and I think it’s safe to say I am nearly a crazy dog lady. Glad to have a Crazy Dog Lady comrade! Thanks for your comment. Your Yorkies are adorable, and I certainly envy your life on a beautiful farm in S. Dakota. I love your blog! Having a dog is the best, and I wish you lots of luck on your journey to finding your best friend. I am obsessed with my dog, so I am always looking for interesting books about them. I came across this one yesterday: “Loveabulls: Life and Love with Rescued Bullies.” All proceeds benefit animals and the photographs are amazing! Good luck! Adopting a dog is so exciting and rewarding. Thanks so much for your comment, Shannon! I’ll certainly have to look into that book. I work with a lot of pit bulls and pit mixes at my local shelter and am always curious to learn more. I think I have claimed the title of ‘crazy dog lady’ LOL Thanks for you kind words today Abby. Lovin’ your blog too!! I always cheered when someone told she got her CDL. I always thought it meant Crazy Dog Lady status, not commercial driver’s license. I’m pretty certain I’m a crazy dog lady. If something ever happens to my husband, don’t expect it to take too long before I’m accused of being an animal hoarder (though I would never have more dogs than I could reasonably care for). In fact, our retirement goal is to be able to start our own rescue. I’ve got a blog living with pets over at blogger: http://lifebypets.blogspot.com/, if you’re interested. I try not to pull punches, so there are posts about losing beloved pets as well as posts about the search for the next one. Hi there. I’m Bruno, me and my girlfriend have 3 dogs. Almost everyday, there’s a part of the day one of us says: “they’re the best thing that ever happened to us!” And they truly are. The best part of our days happens in the morning when we take two of them, Ice and Ervilha (the third one, Sapsi, for stronger reasons is not sharing our home at the moment, but is visited everyday, and I hope it doesn’t take too much time for us to share the same roof) to the park, where they can run free, jump over the bushes and into the mud and they find their friends. They’re our best friends, therapists, our everything. I can tell you’re going to love your dog so much! My dog is the most precious thing in my life. I didn’t have a dog growing up, so when this little guy joined my life I was so surprised- I had never experienced a love so complete and unconditional. Before getting a dog, I thought… “Dog.” And now when I hear that word, I think “Person.” A loving, real person, in every measure that humans are… and beyond in many ways. Nothing makes me happier than my little buddy. So here’s an early congratulations to you on your new home to come, and your family member to be! Is there a breed you like? What a great idea for a blog! Good luck with your research… so many people don’t take enough time to find out what’s involved before getting an animal. I hope that you will continue blogging once you’ve found your canine companion. Congratulations for your blog, I write and my dog is part of my life. Hi Abby – I just discovered your blog, and I am very excited for you! I’ve been around dogs all my life – I have two now – and I laud your efforts to give your [future] dog your very best! My sister is a veterinary surgeon and when our family gets together it’s common to have 5 dogs running about. I have a couple of posts you might find enlightening – 89 Days, 87 and a Half Days, 95 Days. I am looking forward to following your journey with you! Happy writing! P.S. I also volunteered at 2 animal shelters and loved it! OMG! I cannot thank wordpress enough for introducing us! Congrats on being freshpressed! I am also a “slightly obsessive” dog lover who does not yet own a dog, and I just recently (this month, actually) started writing about my love for all things dog and posting my dog photos on my own dog blog. I am an instant fan!! I am in love with everythng about your blog. Thank you sooo much for sharing your thoughts & observations. Your writing & voice are very engaging, and your dog perspectives very inspiring. Thank you sooo much!! Hi, what a lovely blog! I’ve really enjoyed reading it 🙂 I wanted to suggest the Nova Scotia Retriever for a breed love post. Me and my partner adopted a rescue puppy about three years ago, had no idea what she was – she looked like a mongrelly cross between a german shepherd, a collie and a golden retriever, but she was bright red. Over the course of her life with us, a few people have approached us and told us that they’re convinced she’s a Nova Scotia Retriever. We looked into the breed and saw that she pretty much is one. It’s mad as we never intended to get a purebreed. But we absolutely love her – and having learned more about the breed, she’s very typical. They’re gorgeous red dogs, they’re bred for swimming, they’re loyal and protective. She’s intelligent and loves learning new tricks, even at the grand old age of four. We had a tough time with her to start with – lots of testing boundaries – but I guess it was just because she was young and was settling in with us as her new family. a) Our dog lab exists! b) We have a wordpress blog where we discuss all that is dog cognition related. This could interest you and your readers! Thanks so much for your comment, Julie! I’m thrilled that you found the post from WordPress. Dr. Horowitz’s and your work deserves all the recognition it can get! I’m looking forward to reading the lab’s blog and your blog, as well. Thanks so much for sharing! Sure thing! Great presentation of dog cognition research! This blog is incredibly amazing! I am definitely amused by your patience and passion for dogs. What a great blog! Can I suggest a Beagle? I am obsessed with mine. There are pics of him on my blog. Good luck with blog and decision. Been a dog lover all my life. Great blog! I just saw this on freshly pressed and HAD to respond even though I am about to go to sleep. in about 2 weeks i’m getting a little doggy and have been waiting 2 and a half years to get one!! I can totally 100% relate to your longing. Looking forward to reading your blog.. but for now- good night! I’m so glad I came across your very informative site. I’m a still new to wordpress but I’ve already re-created my own The Maltese Chronicle dog blog. I especially enjoy your book reviews. Keep up the good work. Love your blog – we share the same journey. In fact, you might very well be my alter-ego. Thanks for sharing. Wonderful and informative blog. My dogs are my kids, only better behaved. J/K. Seriously though, they have done amazing things for me during my journey, I am very lucky to share my life with them. May you find your perfect and sometimes not so perfect companion (the not so perfect times are what give levity and personality). I just started my own dog blog so I’m learning how to use wordpress. There’s so much info – I need to figure out how to embed links 🙂 Thought I’d check out some other blogs and stumbled on yours. I’ve read a few of your posts, I plan to read more when I have time. I’d appreciate your feedback and suggestions. Yay for volunteering at the SPCA! Does that experience sway you into wanting to adopt a dog from them? I wish I’d found your Blog before my husband and I adopted a rescue this April. Because we owned two pair of Golden Retrievers I thought we knew what we were doing. A rescue is totally different. Volunteering at the SPCA was such a brilliant idea. Recently I was having problems with Luna, our rescue. A friend sent two links abut what socializing is which I would like to share for others like me who got it wrong by taking our rescue to the dog park. I have contacted a positive reinforcement trainer and will be working to undo the damage. You’re doing a great job with Pyrrha, Abby. I am learning so much from your experiences. Woof woof and hello… Pleasure to meet you! Looking forward to following your blog! Hello, I would like to nominate this blog for the Versatile Blogger Award. Please understand that there is absolutely NO obligation to accept, repost or follow any of the VBA rules (which can be quite tedious). And should you prefer me to take down the link to your site from our VBA post, I will. Just let me know. We nominated you because we enjoyed your blog but we do not want to inconvenience you in anyway. Wow! You are one of the very few people who actually took the time to do research, learn, and take a look at blogs about dogs. You are amazing and what an amazing way to start as a pet parent. I wish more people were like you. Your girls are very beautiful. Just found your blog and read that you’re taking a break! Good for you — but unhappy timing for me. I just happened to stumble on your blog. Your work delightful, professional, informative, and for me personally, fascinating. I too have a GDS; he’s my service dog (I have MS) and couldn’t imagine my life without him. I’ll keep checking in to see when you’re back on track. In the meantime, looks like I’ve got a bit of reading from your past posts, to catch up on you! All the best to you, and hugs and pats to your furry family. Gosh — I just reread my “reply” which reminds me (once again) not to write when I’m tired. I left out “is” after “work” and meant to say I had a GSD (German shepherd dog) not a GDS (whatever that is?). Hope you’ll be back posting soon. Take care! I just shared your blog https://thedoggerel.wordpress.com/2011/07/21/6-types-of-people-who-shouldnt-get-dogs/ because there are many pages on FB that are constantly posting lost dogs, dogs no longer wanted etc. and I just had to let people know that not everyone should have a dog. I really appreciate you writing this blog and will now be following you. On another note, I adopted my GSD from Southeast German Shepherd Rescue also. Great group of women. I own a pet supply (everything but food) online business called primepetboutique. Dogs are a passion of mine and I hope to continue to offer unique products for other pet people. I am a Pug Person incarnate! For all their health problems (brachycephalic dogs have been so deformed, sadly), pugs (preferably black) are the only breed for me. What I am looking for is a book written specifically for training brachycephalic breeds. I look at books that show training large dogs, dogs with muzzles and normal breathing apparatus, dogs that were bred to hunt, work, or herd, and many of the training protocols are not easily applied to pugs, etc. Pugs don’t normally fetch or carry anything but toys in their mouths. They tire easily. Jumping is not a good idea for them. If anyone out there either knows of an excellent specialized training book for these flat-faced breeds, please let me know. Any dog people/trainers out there who are writers–please let your dog writing community know there is a HUGE need for this specialized book–well researched and written and with photos! I have taken my pugs to obedience and trick training classes, and they do learn, but there are so many things that are not appropriate for them. Pugs, etc. CAN learn,but not like Australian shepherds or Border Collies, GSDs, Dobes or Weimaraners, Labs, or Goldens, or various terriers, many of whom show up in the same classes. It’s very demoralizing for both me and my pugs 😦 When they do learn something, it is a thrill to see their joyous smooshed faces realize they DO have a brain and can learn! I am sending your question to our dog training consultant (5-Time Canadian and Wrolds champion). Even though most of her awards are with German shepherds, she also has a devoted following of people throughout the world who have all kinds of dogs. If she has any suggestions, I’ll post them here, or you can write to me at: mymagicdog.com.